It’s one thing to get diagnosed with an illness it’s another to have the fear of the diagnosis itself prevent you from seeking treatment. 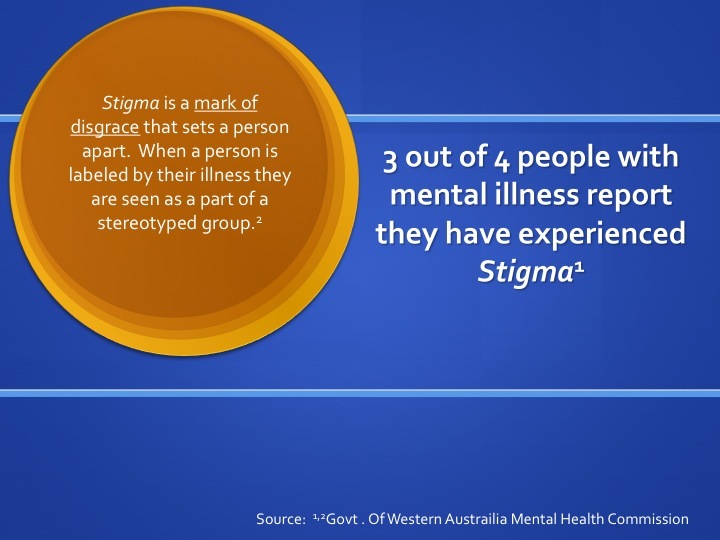 The stereotypes and prejudice that exists with mental illness are deeply ingrained in our society. I remember when I was grappling with accepting my bipolar diagnosis how I prayed to God to give me any disease but a mental illness. My own self-stigma kept me from getting the treatment I needed and caused me to suffer far more than was necessary. 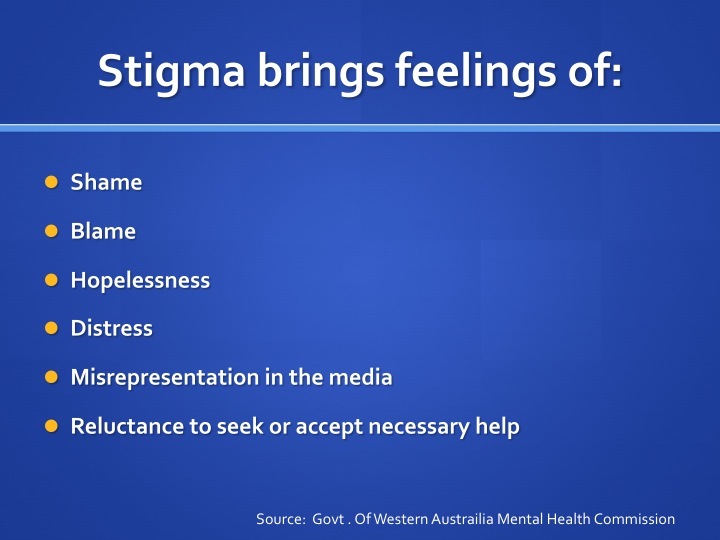 Stigma has had negative impacts in other diseases too. Not too long ago even women who were diagnosed with breast cancer faced enormous Stigma. Now the support for breast cancer awareness is enormous and that’s a good thing. Maybe one day we’ll have the same kind of support and awareness for mental illness. Illness of any kind is difficult but when you are trying to muddle your way through understanding a complex stigmatized disease it makes the road to recovery even tougher. It’s as if someone puts enormous barricades on a road and tells you to drive right through them to reach your destination. And heaven knows there are enough obstacles in the pathway without adding Stigma to the mix. Lot’s of people suffer with mental illness without getting treatment because of Stigma. Creating awareness is one of the keys to busting the chains of Stigma. Is there one thing you can do today to help break those chains? Thanks for the feedback! We are definitely on the same page. I look forward to reading your blog. Thanks so much for your comment. I really do believe one day the Stigma will be less and less. Can you imagine what that will be like? Mental Illness and Disability is sadly portrayed in the wrong light. I love that there are forums and support groups that help people who are feeling lost, alone, or afraid. I am currently in an Occupational Therapy Assistant program, and being in this program has really opened my eyes so much to stigma and the affects it has on people. I hope that positive people like you all can continue to spread awareness so others can be helped in their time of need. I also hope to continue to be involved more in the community to help spread stigma awareness. Thanks for your comment. Those who live with mental illness and disabilities have often been marginalized by society. It is now time we stand up and let our voices be heard. We are people too! Thanks for stopping by my blog!